October has started. It’s the season of red-leafed huckleberry bushes, golden larches [blatant excuse to stick in a hiking picture], rain, wild mushrooms and… cod liver oil. In honor of October, I’m reworking a post I wrote a few years ago at my old site, on cod liver oil and vitamin D.
Once again, the long, wet and cold season is arriving here in Seattle. The days are getting shorter and the skies, greyer. Stand outside too long in the drizzle, or the sun breaks, and you might start to grow moss. But you might not start to produce vitamin D.
You’ve heard vitamin D called “the sunshine vitamin,” but it’s not actually Seattle’s clouds that constitute the primary culprit in our winter vitamin D deficiency. True, most of our days are so cloudy that we get very little sunlight, but even when the sun is out, studies suggest we don’t actually get a significant amount of vitamin D from sunlight in winter at this latitude. In one study, people in Boston (lower latitude than Seattle) couldn’t produce cutaneous vitamin D3 on sunny days between November and February, while people in Edmonton, AB (higher latitude than Seattle) couldn’t produce it between October and March. To stay healthy, it’s important to get adequate vitamin D3 from a reliable source, one where the vitamin is natural, and appears with other fat-soluble vitamins and omega-3 fatty acid. So, this is a good time of year to start thinking about adding cod liver oil as a supplement to your diet. Cod liver oil is rich in vitamin A, omega-3 fatty acids and vitamin D3. Vitamin D doesn’t appear in many foods, so, at least in warmer months, sunlight is our primary source of vitamin D.
I actually just had my vitamin D levels checked and they’re not too bad, but most of us are deficient most of the time. And actually, latitude isn’t the only problem. Vitamin D deficiency is rampant, even in summer, and even in equatorial countries where residents get a lot of sunlight. We often hear behavioral reasons for this: we’re outside less in every country, people wear long clothing in many equatorial countries, etc. But in reality, it’s often factors like diet and obesity that interfere. There are reported relationships between vitamin D deficiency, obesity, latitude, and glucose metabolism. And not only does vitamin D deficiency contribute to obesity, but obesity seems to make it harder to correct vitamin D deficiency in some studies. The correlation between the two is strong. Add enough cheap vegetable oil, sugars, flour and fast food to a country’s diet and you’ll see obesity levels skyrocket, along with vitamin D deficiency. Worse, natural fats that disappear from diet (like traditionally-rendered animal fats from animals on pasture) were actually a good dietary source of vitamin D in many of our cultures. Oops. In previous eras, vitamin D deficiency was associated almost exclusively with the presence of rickets. However, research in the last decade or so [like this] has moved awareness of this hormone-vitamin to a more prominent place in our understanding of health and nutrition. Vitamin D deficiency may play a preventative role in other diseases attributed largely to environmental conditions. Meanwhile, cod liver oil, or equivalents thereof (e.g. oolichan grease in Northwest native cultures) used to be routinely given to children and adults, particularly sick ones, in winter. This information has gone culturally by the wayside. The list goes on. Vitamin D3 is an essential vitamin and also facilitates absorption of other critical nutrients. It’s associated with bone health, mood, and protection against a number of diseases, including cancer, and autoimmune diseases like multiple sclerosis as well as diabetes and insulin resistance. There also seems to be an association between vitamin D intake and lowered cardiovascular disease risk. There is some indication of a link between vitamin D deficiency and asthma, another disease correlated with exposure to environmental pollutants. An overview of gestational vitamin D deficiency noted links to future health effects such as cardiovascular disease, diabetes, obesity, cancer, and permanent disruptions to the central nervous system’s formation, as well as future vitamin D responsiveness in the infant brain. This makes vitamin D sufficiency yet another aspect of health incredibly important for pregnant women or women of child-bearing age who are considering future pregnancy at all. I wrote a little more about the connection between vitamin D deficiency and autism here and here (a series I’ll repost and finish here at the new blog at some point). The recommended daily dosage of vitamin D has been lower than it ought to be for years. By some estimates, the recommended daily allowance is only about a tenth the amount we need. This is slowly changing. Recently, the American Academy of Pediatricians recommended doubling the childhood dose of vitamin D, after years of seeing deteriorating childhood health and disease susceptibility strongly correlated with poor vitamin D intake. High intake of vitamin D is also essential for pregnant and breast-feeding mothers, so their children can have adequate vitamin D at early stages of life. 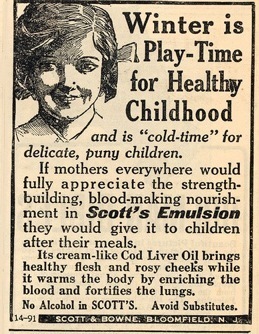 But wait… cod liver oil? Doesn’t that taste terrible? The terrible taste, and past generations’ memories of it, has not helped its, uh, branding reputation in our culture. My grandmother remembers hiding under the bed to avoid the dreaded spoon. It’s also considered old-fashioned; a German friend of mine balked when I asked him if it was still used in Germany. No, he said, that’s something his grandmother would have done, along with making sauerkraut. A stereotype! I broke it to him that I both take cod liver oil and make sauerkraut. No offense intended. And actually, it doesn’t taste as bad as it used to. The kinds on the market are pretty palatable these days, and it doesn’t take long to get used to them, and if you take it daily, you really do. I may enjoy cod liver oil less than I enjoy grass-fed butter or huckleberries, but I do enjoy knowing I’m taking care of an essential part of my health. And actually, I don’t mind the taste. By the way, for those who have experienced the unpleasant side effect of burping up the flavor of cod liver oil, this symptom is reduced for a lot of people by taking the oil right before or with a meal. To make it go down easier, I usually down some whole milk or cream right after taking it. This adds fat, which is good since these are fat-soluble vitamins. I take this brand of cod liver oil, Blue Ice (and no, there’s no official sponsorship; they have no idea who I am or that I recommend their cod liver oil. I don’t take sponsorships.). Some brands of cod liver oil are processed in such a way that the naturally-occurring vitamin A and D are removed, and synthetic versions are added back in. That’s not true of this one. Also, it claims to be sustainably harvested. So help your body resist the winter blues this year. Strengthen your immune system and disease resistance. Down a half spoonful of cod liver oil every day, and see how you feel this winter. For even better intake of essential fat soluble vitamins, take it with some grass-fed butter, and you’ll also be getting some Vitamin K2 MK-4. Plus, you’ll get to eat butter. Or, you can get their version of cod liver oil that has grass-fed butter oil (concentrated butter) mixed in. Rajakumar K, Fernstrom JD, Holick MF, Janosky JE, Greenspan SL. Vitamin D status and response to Vitamin D(3) in obese vs. non-obese African American children. Obesity (Silver Spring). 2008 Jan;16(1):90-5. Heaney RP. Lessons for nutritional science from vitamin D. Am J Clin Nutr. 1999 May;69(5):825-6. Alemzadeh R, Kichler J, Babar G, Calhoun M. Hypovitaminosis D in obese children and adolescents: relationship with adiposity, insulin sensitivity, ethnicity, and season. Metabolism. 2008 Feb;57(2):183-91. Weiss ST, Litonjua AA. Childhood asthma is a fat-soluble vitamin deficiency disease. Clin Exp Allergy. 2008 Mar;38(3): 385-7. Epub 2008 Jan 2. Levenson CW, Figueirôa SM. Gestational vitamin D deficiency: long-term effects on the brain. Nutr Rev. 2008 Dec;66(12):726-9. Review. Grey V, et al. Prevalence of low bone mass and deficiencies of vitamins D and K in pediatric patients with cystic fibrosis from 3 Canadian centers. Pediatrics. 2008 Nov;122(5):1014-20. Kalueff AV, Eremin KO, Tuohimaa P. Mechanisms of neuroprotective action of vitamin D(3). Biochemistry (Mosc). 2004 Jul;69(7):738-41. Garcion E, Wion-Barbot N, Montero-Menei CN, Berger F, Wion D. New clues about vitamin D functions in the nervous system. Trends Endocrinol Metab. 2002 Apr;13(3):100-5.